North London was rocked last night. It registered 9.9 on the Twitcher scale and how much fun was that? OK it's not a massively important win in the scheme of things. It's the cup we don't want to win but it's a victory, and a rather heavy victory at that, over our so called (geographical but certainly not aspirational) rivals. It puts them in their place. It shuts up their players who seem to think they are our equal. They are not our equal as by losing they have lost a genuine chance of winning a pot. They'd be happy to win that. Maybe we should too but we've got bigger things ahead of us. We might not win them but we might. They won't. The first half was a joy. More lessons for 'arry to learn. We played them off the pitch. Great fun. The second half saw the introduction of their big guns if you can call Keane & Lennon 'big' or 'guns'. It paid off as a hopeless linesman who flagged us offside wrongly twice gave an offside Keane onside for the annoying got to pass it to Flappyhandski who made very little effort to stop it. Enough Arsene! Move him on. Two clear penalties converted topped off with a nice move by Arshavin gave us an enormous win. 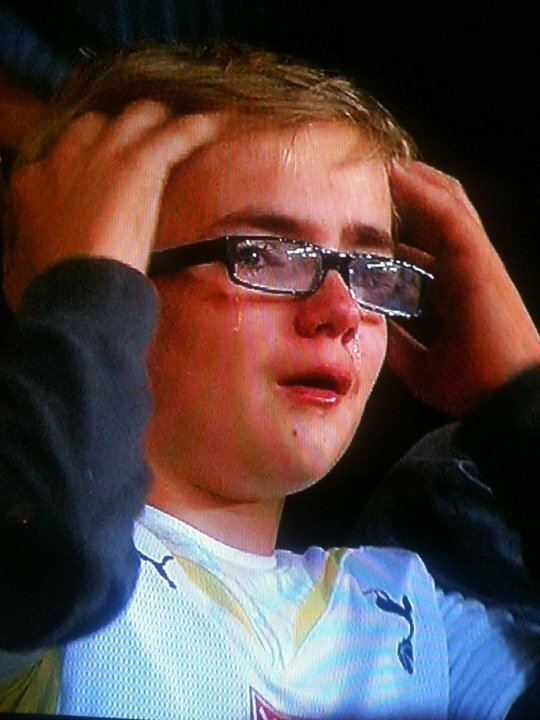 Spud kids were crying as Gooners chanted "shall we make a DVD" & "are you tottenham in disguise" while the team played the 'wayhey' passing game. All the songs were coming out. Glad the pope is still telling the spuds where to go. Arsene couldn't get a signal to text his substitutions. He knows how I feel in the Clock End when I try to text the man from Eastlower a rude word to describe a Bolton player. Imagine Eastlower's surprise as he goes through Arnos Grove an hour after the game ends and his phone pops up with 'Bast*rd'. Poor Pat's phone vibrated all night as he was trying to sleep. A cracking nights work. Jack was immense despite being assaulted every 3 minutes. What a prospect. Spuds can only dream of such an English homegrown talent. Glad to hear the spuds megastore (why do they need a megastore?!) was inundated with Gooners calling about the DVD. Good work. But there won't be a DVD. There won't be a t shirt or an open top bus parade because big clubs don't do that. We'll take the mick for a bit & move on to bigger and better things. But for the next few days we will enjoy it. "we beat the Scum 4-1!"